Your commercial overhead doors and residential garage doors were installed for the simple purpose of allowing easy access to a car port. These doors also double as a secure area to store personal belongings or business goods. If your garage door installation service was not top of the line, you could have some serious problems. The garage door specialists at TGS Garages & Doors will service your residential or commercial garage doors before disaster strikes. Entrust the care of the most important door in your life to the experts at TGS Garages & Doors. 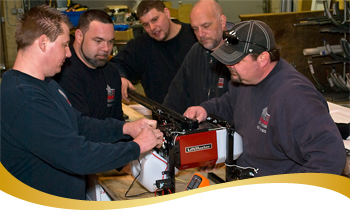 Our certified technicians, knowledgeable office staff and extraordinary service–combined with superior quality products make us your garage door go-to team. The TGS trademark — Quality & Reliability that Make you Smile! Speaking of smiling, you’ll notice a constant in everything we do–a happy face. For as long as our family can remember, our mother signed everything she touched with a happy face, leaving a bit of joy wherever she went. This became our family and company trademark and greatly influenced how we treat others. TGS Garages & Doors currently serve 10 counties throughout New Jersey including Burlington, Camden, Essex, Gloucester, Mercer, Middlesex, Monmouth, Ocean, Somerset & Union.